To be really good at anything—painting, playing guitar, hitting a baseball—generally requires a level of single-mindedness that few possess. Fewer still have the focus to master two arts as disparate as long-distance running and bank robbery. But those were the twin passions of Johann Kastenberger, who spent the ‘80s setting Austrian records for marathon running and robbing several banks, on occasion making the two dovetail to great effect. Andreas Lust stars as Johann Rettenberger, a fictionalized version of Kastenberger, in “The Robber” (“Der Rauber”), writer-director Benjamin Heisenberg’s adaptation of Martin Prinz’s novel of the same name, is a study in obsession. When we meet Rettenberger, he’s getting a pep talk from his parole officer as he’s about to be released from prison. His P.O. is concerned that he plans to go back to a life of crime, which is plainly inevitable. While going through the motions of applying for work with ex-con friendly employers, Rettenberger runs into Erika, a young women he knew years ago. “You’re all grown up,” he notes. Rettenberger wastes no time getting back to his real work, and is so focused on robbing banks that when one job goes bad, he literally runs around the corner to the next bank to make a “withdrawal.” And at the same time, he’s undergoing blood tests and video analysis of his running on the way to running marathons in a world-class time. He even employs heart meter he uses for his training to record his pulse during robberies. Lust is maddeningly stoic as Rettenberger, he doesn’t appear to feel anything, except maybe the periodic flash of anger, and he never lets his guard down, not for Erika or the audience. It can be frustrating to watch, as we get no back story, no interior life, no sense of who or why he is. But that’s the point, as he says to Erika at one point, “What I do has nothing to do wit what you call life.” He runs and robs banks for the same reason the sun sets and rises—‘cuz that’s what it does. 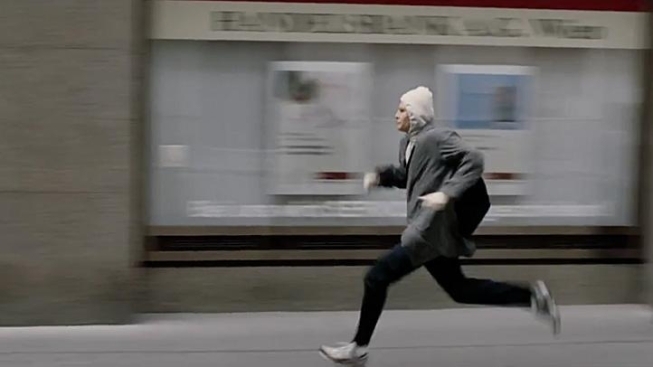 The scenes of him running from the law are edited with whipsaw precision, as he darts down alleys, stairwell, through forests… It turns out that being able to run 26 miles is a valuable asset when you’re robbing banks. But the overall pace and tone are very much in the tradition of the art house thriller, and will no doubt feel familiar to anyone who saw “The American” last year (though it should be noted “The Robber was released first). “The Robber” is a quiet, engrossing and delicate piece of filmmaking that occasionally explodes with action. You can see why Andrew Garfield wants to remake it, let’s just hope they don’t mess it up.